Iwadeyama"- Little Kyoto" SUBPAGE | All Japan Kyoto Association"
Approx. 50 km to the northwest from Sendai City lies Iwadeyama Town. The Eai River flows down from the Ou Mountain range and brings fresh water and air to the town. This is where a famous samurai lord, Masamune Date, spent his passionate youth for 12 years before he settled in Sendai Aoba Castle. 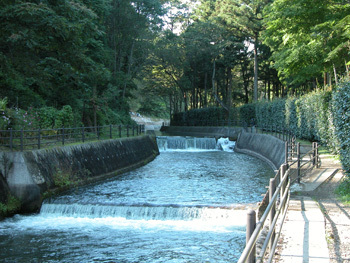 A manmade canal called Uchikawa was maintained for defensive purposes. Over 400 years later, this historical canal along with its trees presents pleasant scenery to locals and visitors alike. Both the third-generation master, Toshichika, and the fourth generation, Murayasu, of the Iwadeyama Date Family, welcomed their wives from the Reizei Family, members of the nobility from Kyoto. 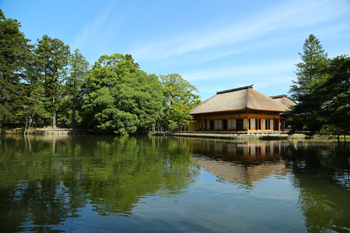 Visitors can discover many historical remains influenced by Kyoto in Iwadeyama, such as the local study center, “Yubikan,” a strolling style garden with a large pond, Shinotake bamboo craft techniques, Sake Manju sweet dumplings, and more. It is said that this historical building was established in 1677 as the retired residence of the second-generation master of the Iwadeyama Date Family, Munetoshi. After it was utilized as a residence by some other people after Munetoshi, it was converted into a study center for liegeman and young people. There was an auditorium called “Gokaisho” as a main building, a study center called “Yubikan,” and a training center for martial arts. The main building had one story with a thatched roof supported by four pillars. Facing a large pond, a fine view unfolds right in front of the main room. The garden was created by the fourth master, Murayasu, in 1715 employing Dokan Shimizu, who was the third master of the Sekishu School of tea ceremony and taught tea ceremony to the Iwadeyama Family, as the designer. With the cliff-face of Iwadeyama Castle as a backdrop, it is a fine example of a strolling style garden with a pond. There is wooden frame which displays a calligraphy work by Dogan Sakuma, a famous scholar born in Sendai. The successive members of Ujiie Family resided in Iwadesawa Castle. When the castle was abandoned after the Osaki and Kasai Insurgence, the first Tokugawa Shogun, Ieyasu, retained and restored it in 1591. In the same year, Masamune Date came to rule the region from Yonezawa, Yamagata Pref. under the commission of Hideyoshi Toyotomi. It was Date who renamed this region as Iwadeyama and he lived here until moving to Sendai. There is a spot called Hachimandaira where Ieyasu buried tools he used during the restoration and is enshrined by people as a sacred place. The old site of Honmaru, Ninomaru and Sannomaru have been renovated as a park. 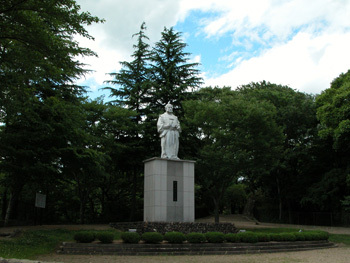 A large statue of Masamune Date, moved from Sendai Castle to this location in 1964, stands on the former site of Kanamaru and commands a grand view of the Osaki Plain Field. Located in the vast castle precincts is a popular flower viewing site for cherry blossoms and azaleas in spring. The Uchikawa River, running through the center of Iwadeyama Town, is a manmade canal that was developed as an outer moat when Masamune Date built Iwadeyama Castle. Water was an important life source for the local people for farming, daily life and fire prevention. Even after a large-scale renovation, Uchikawa River still retains its historical appearance and was selected as one of the 100 Beautiful Canals in Japan in 2006. In 2016, it was also designated as a “Heritage Irrigation Structures.” Along the river stretches a nice walking path called the “Path of Study” which is a nice recreation area for local people and visitors. Iwadeyama Town’s representative traditional craft is bamboo craft using Shino-take bamboo. Its origin is said to date from around 1720 when the fourth-generation master of the Iwadeyama Date Family, Murayasu, invited bamboo craftsmen from Kyoto and encouraged them to improve their skills in Iwadeyama. At the Bamboo Craft Museum, the inviting natural scent of bamboo welcomes visitors while the sound of bamboo chimes tells of the merging 300-year history of the Date Family and Kyoto culture. Visitors can watch a bamboo craft demonstration by the craftsman and can try their hand as well. 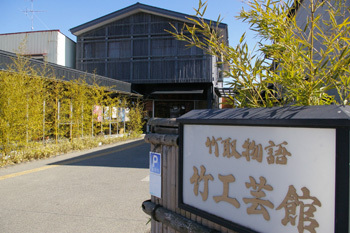 A variety of bamboo crafts, from traditional to contemporary, and art works are exhibited. Kami Kaido is an old highway which branched off from the Dewa Kaido Highway and then merged with the Oshu Kaido Highway in Ichinoseki, Iwate Pref. Most parts of the highway follow a steep and mountainous road but some sections remain flat. Known as Senbon Matsu Nagane, this flat path extends approx. 1.5 km with pine trees on both sides. 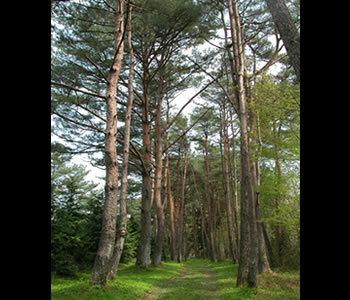 Walking through the tunnel of pine trees is an outstanding experience. On the Kami Kaido Highway, there is a pair of old sign boards from the Edo period showing distances. The Mutsu Kami Kaido Highway was designated as a National Historical Site in 1990. The Masamune Festival started in 1964 to commemorate the relocation of a massive statue of Masamune Date from Sendai Aoba Castle Site to its present location in Iwadeyama. Japan was going through the civil war period under the strategy of Hideyoshi Toyotomi’s unification of the country and this was when Masamune Date resided in Iwadeyama Castle. 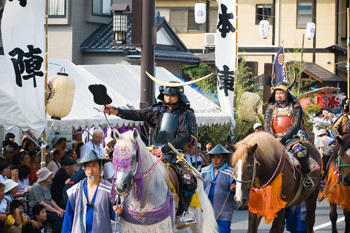 During the festival, there is a large procession of people dressed in samurai armor. Blowing conch shell horns, participants recreate the valiant world of the Japanese samurai period. Colorful air balloons will adorn the blue autumn sky of Iwadeyama, the elegant “Little Kyoto.” As an official event certified by the Japan Balloon Federation, a number of balloonists come together every year at the Osaki Balloon Festival and compete their air balloon skills. During the festival, an air balloon mooring experience is open to visitors. A demonstration flight of a small plane and powered paraglider competition will be also held. The origin of Shino-take bamboo craft in Iwadeyama is said to have started when the fourth-generation master, Murayasu Iwadeyama Date (1681-1731) invited bamboo craftsmen from Kyoto and encouraged them to improve their skills in Iwadeyama. 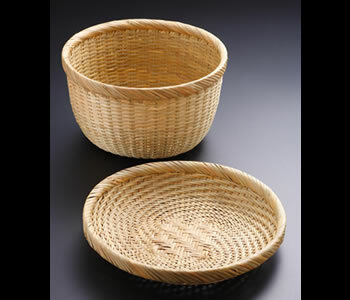 Using wild Shino-take bamboo grown in Iwadeyama, craftsmen skillfully weave sieves and baskets taking advantage of its high flexibility and elastic properties. Shino-take bamboo craft is designated as the traditional craft of Miyagi Prefecture. At the same time, not only the traditional style but contemporary styles for interior decoration are emerging such as combining with glass and ceramics. New collaborative creations with other traditional crafts are also developing. “Shimippanashi” is a frozen tofu and a traditional food of the Iwadeyama district of Osaki City. 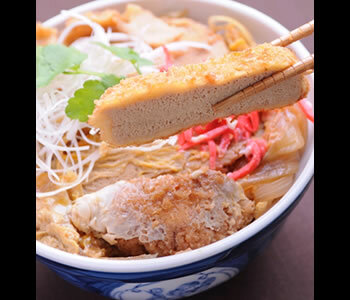 Pieces of Shimippanashi are deep-fried and cooked with savory egg and topped on the rice bowl. The fine taste of Japanese soy beans “Miyagi Shirome” spreads in the mouth. Not only is it healthy but also the satisfactory volume pleases diners. Shimi-dofu is a frozen tofu which is a winter specialty of Iwadeyama. Around 1842, a man named Shogoro Saito learned how to produce frozen tofu in Nara and brought the skills back to Iwadeyama. Frozen tofu became an important income for the local people during winter as well as important nutritious food, especially for protein. 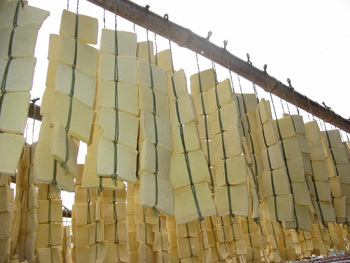 The production method has developed in accordance with the climate and culture of Iwadeyama and it is still a popular local food today. What is special about the Shimi-dofu in Iwadeyama is that they dry the tofu naturally in the wind and have them frozen for fermentation. By unfreezing the tofu with water, any excess water is eliminated which enhances the real taste of tofu. 100% soybean only, a natural food born from the severe cold winters of Iwadeyama. Date Gottso-men is a noodle made from low-protein rice, “Shun’yo”, grown in Iwadeyama and potato from Hokkaido. It contains less protein and gluten compared to other noodles so it is recommended for those who are on a diet or have food restrictions. Their firm texture impresses diners and no food additives are used. Date Gottso-men goes well with any style of soup, from Japanese, Western to Chinese. A special soup in four different flavors is available. 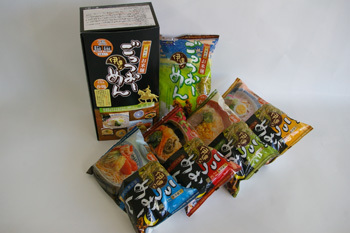 It received the Award for Excellence in the Japan Agriculture Newspaper Competition of Local Food Item in 2006. The origin of this local food started during the time of the fourth Iwadeyama Date Family master, Murayasu, who brought a man named Tauemon, a skilled sweets producer in Osaka, to Iwadeyama. 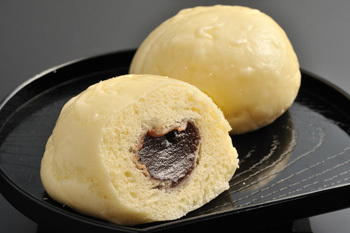 Produced by a time-honored shop, the Sake Manju is praised as “No better sweets than Sake Manju exist in this world.” The secret is their homemade unfiltered sake which provides the aromatic flavor of sake. Best recommendation is to eat a piece in the shop. The dumplings are available online, too.